The Dallas–Fort Worth metrople (DFW) in North Texas has been rattled by 11 earthquakes in just over one day, between January 6 and 7, 2015. People from Dallas to Irving, Grapevine to Plano, Bedford to Mesquite, all reported feeling at least one of the quakes on Tuesday or Wednesday. People report shaking houses, cracks in walls and ceilings and earthquake booms! Epicenter Irving of earthquake swarm that rattled DFW area in January 2015. 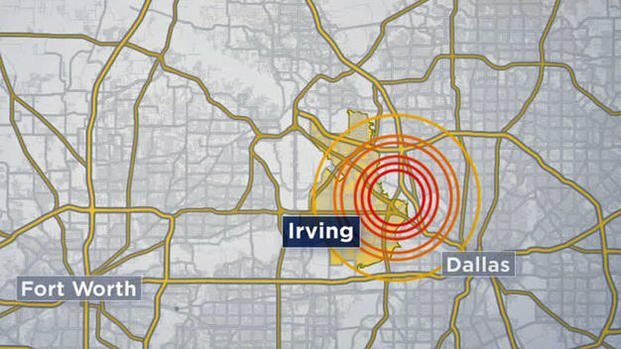 Earthquake booms have been heard and felt as a swarm of 12 small earthquakes has rattled the DFW area, all centered around the old Texas Stadium site in Irving. 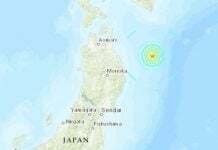 The latest one took place just before 10:00 a.m. and measured 2.7 in magnitude. 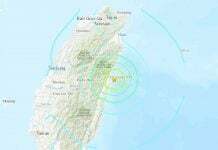 Another quake about 90 minutes earlier registered in at a 2.6 in magnitude. Tuesday’s tremors were the largest since the earthquakes started happening there in the last year. 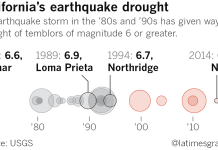 The quake cluster indicates stress in the Earth’s crust that needs to be relieved. However it does not seem related to fracking operations as there are no oil and gas disposal wells in Dallas County. There have been at least 26 earthquakes in the Irving area since November 1, 2014. Prior to that, a booming earthquake swarm rocked the Azle area series of booming earthquakes in November and December of 2013. Just in case, I would call my insurance agents to know if earthquake damage is covered in my policies. You never know.